Checking out sites for my calendar mysteries, set in Kansas City around 1900, can involve quite a bit of sleuthing. Take the New England Building at 9th Street and Wyandotte in Kansas City, MO, for instance. While working on January Jinx, the first in the series, I decided to put Price Investigations in the New England Building instead of the New York Life Insurance Building, mostly because the upper floors of the latter were closed to visitors. (Indeed, when my friend Sally O and I sneaked down to the basement to scope out the placement for the café that appears in January Jinx, the building guard stood on the steps and called plaintively, “Ladies, ladies.” Giggling, we did come back upstairs and out of the building.) But on a later junket, I was able to get inside the New England Building and go up the steps to the second floor though not inside any of the offices. The New England Building continues to serve as the site for Price Investigations in Fatal February, the second in the series, but now that I’m working on Mischief in March, I have some questions about the offices that I didn’t answer in my initial site visit. 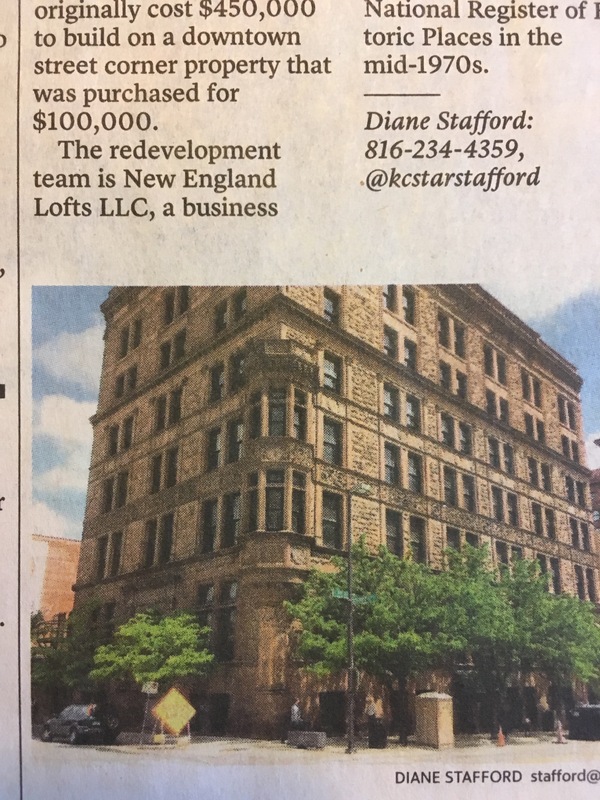 In particular, I’d like to actually see the inside of the New England Building’s most famous architectural feature, the oriel on the southwest corner, to figure out what George Mathison, the manager of my fictional detective agency, might have put in it, or indeed if it’s actually available to put anything inside it. 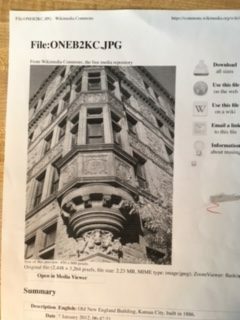 I’d tried to figure out its size from the Sanborn Fire Insurance Maps and tentatively decided, given the 60’ by 118’ overall size of the building, that the oriel is about five feet across at its widest. But the map gives no details about the floors above the first. 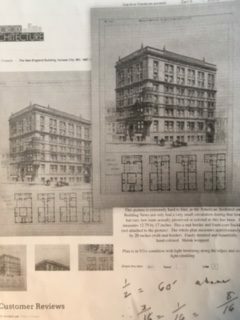 An exquisite poster of the building made from an article in the American Architect and Building News that I found online shows the basic layouts of four of the floors. But the text isn’t distinct enough for me to find out details about the offices. Besides, now that I’m revising Mischief in March, I’m finding that Minty Wilcox, the heroine of the series, needs to navigate around more of the building than just up the stairs or elevator to the third floor. So, recently I set off to the Kansas City site of the State Historical Society of Missouri, located in 302 Newcomb Hall on the University of Missouri-Kansas City to look at their collection of architectural drawings that included the New England Building. An aside: doing historical research is so much easier these days than it was when I started the project in 2004. (Yikes!) Now you can scan documents to a flash drive instead of printing them out on a library machine. Also so much has been digitized and made available online, like the Sanborn Fire Insurance Maps, that you can download and print for free. That’s the good news. 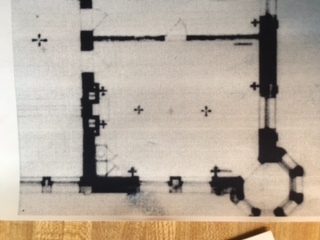 The bad news about the scans of the drawings is they don’t have keys and most of the written info is too blurry to read when I blow the images up. Still, I was able to see inside the offices to figure out where the lights were and that most had little closets and sinks. Some suites had ladies and gents powder rooms. 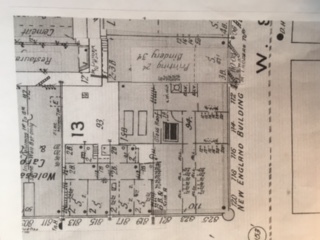 And after a quick referral back to the Sanborn Fire Insurance Map, I found that the building had steam heat. Comparing the office layout with the roof layout, which included chimneys, I figured out where the radiators were, so I now can appropriately arrange the furniture inside Price Investigations. See? I told you researching historical fiction requires sleuthing. Unfortunately, there are two parallel dotted lines across the narrow entrance to the oriel that I don’t understand. I’m tentatively thinking there would be room maybe for the ever-popular Boston fern. But I don’t know for sure. By now, you’ve probably noticed that historical fiction writers obsess over the smallest details. That’s because some expert out there might make a fuss online about a tiny error. And that mistake could destroy the old Kansas City I’m trying to bring to life in my calendar mysteries. So I worry about the tiny details. And so if at all possible, I’d like to get inside the New England Building. This might not be easy because recently it was purchased for redevelopment as loft apartments. I’ll keep you posted on what I find out.